Visiting Grinnell Glacier and Highline Trail will get you outdoors. There's lots more to do: get to know the fascinating history of Garden Wall, admire the verdant scenery at Logan Pass, trek along Iceberg Lake Trail, and tour the pleasant surroundings at Avalanche Lake. To see where to stay, traveler tips, ratings, and tourist information, read Glacier National Park trip builder . 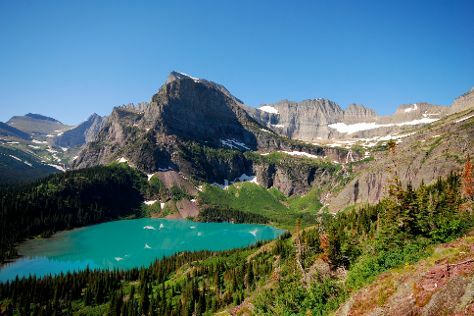 Washington DC to Glacier National Park is an approximately 10-hour combination of flight and taxi. You can also do a combination of flight and car; or drive. You'll gain 2 hours traveling from Washington DC to Glacier National Park due to the time zone difference. Traveling from Washington DC in June, expect nights in Glacier National Park to be cooler, around 45°F, while days are little chillier, around 75°F. Finish your sightseeing early on the 3rd (Mon) so you can drive to Coeur d'Alene. Coeur d'Alene is the largest city and county seat of Kootenai County, Idaho, United States. Start off your visit on the 4th (Tue): take in the history at Old Mission State Park and then explore the landscape on two wheels at Trail of the Coeur d'Alenes. On your second day here, stop by KnitKnit and then identify plant and animal life at Tubbs Hill Nature Trails. For reviews, ratings, traveler tips, and tourist information, refer to the Coeur d'Alene trip planner . You can drive from Glacier National Park to Coeur d'Alene in 6 hours. Alternatively, you can do a combination of taxi and train. Traveling from Glacier National Park to Coeur d'Alene, you'll gain 1 hour due to the time zone difference. Plan for somewhat warmer nights when traveling from Glacier National Park in June since evenings lows in Coeur d'Alene dip to 51°F. On the 5th (Wed), wrap the sightseeing up by early afternoon so you can drive to Seattle. Start off your visit on the 6th (Thu): get a taste of the local shopping with Pike Place Market, identify plant and animal life at Mercer Slough Nature Park, then take a stroll through Pioneer Square, and finally steep yourself in history at King Street Station. Keep things going the next day: take in panoramic vistas at Space Needle, then explore the world behind art at Chihuly Garden and Glass, and then take in the waterfront at Hiram M. Chittenden Locks. To find where to stay, more things to do, traveler tips, and more tourist information, read our Seattle trip planner . Drive from Coeur d'Alene to Seattle in 5.5 hours. Alternatively, you can fly; or do a combination of bus and flight. Traveling from Coeur d'Alene in June, expect somewhat warmer with lows of 57°F in Seattle. Finish your sightseeing early on the 7th (Fri) so you can travel to Portland. 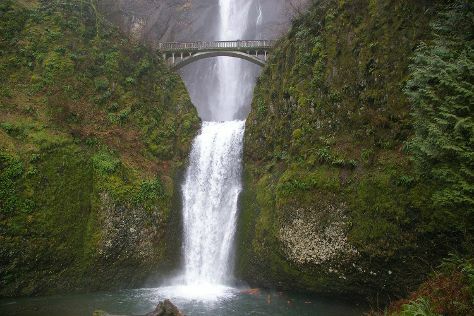 Start off your visit on the 8th (Sat): take a peaceful walk through Starvation Creek Ridge Loop, then take in the dramatic scenery at Multnomah Falls, and then stop by Powell's City of Books. On the 9th (Sun), you'll have a packed day of sightseeing: steep yourself in history at Pittock Mansion, look for all kinds of wild species at Hyland Forest Park, stroll through Oregon Zoo, then take in nature's colorful creations at International Rose Test Garden, and finally take in nature's colorful creations at Portland Japanese Garden. Ask Inspirock to suggest an itinerary and make planning a trip to Portland fast, fun, and easy. Traveling by flight from Seattle to Portland takes 3 hours. Alternatively, you can drive; or take a bus. In June, daily temperatures in Portland can reach 77°F, while at night they dip to 56°F. You will have some time to spend on the 10th (Mon) before leaving for home.